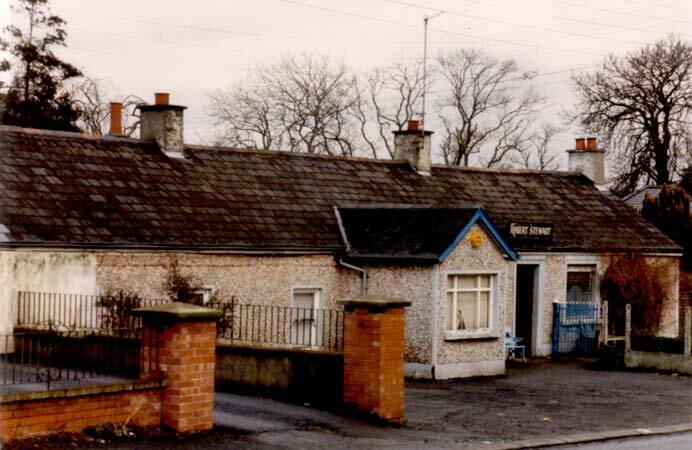 Robert Stewart's pub 1991 before the extension. Unique licensed premises occupying an excellent location just off Belfast's Upper Malone Road at Drumbeg. Although the property is set in rural surroundings close to Sir Thomas and Lady Dixon Park, Belfast city centre is only a ten minute drive away. The public house is known locally as "Wee Geordie's" and it is thought that there has been a pub on this site for approximately 300 years. This sale represents a rare opportunity to acquire a leasehold interest in a licensed property with considerable historic interest. NO. 149 BAL LYSKEAGH ROAD .......Licensed Premises known as "Robert Stewart's"
Traditional style public bar capable of seating approximately 30 persons at fixed bench seating. Finished with the original mahogany bar counter and cabinet, tiled floor and open fire. Kitchen: with half tiled walls and tiled fireplace. Large garden to rear of property with small enclosed garden at front. A pair of semi detached two storey dwelling houses, in need of'-some repair. Each dwelling comprises Living Room, Kitchen and Bathroom at ground floor, with two bedrooms at first floor. Two outhousesCar parking area together with a detached garage located at the rear of Number 147. LEASE DETAILS The premises are held on a thirty year lease from 1st November 1963. Public auction to be held on Wednesday 5th August 1992 at 12.00 noon at The Dunmurry Suite, Beechlawn House Hotel, 4 Dunmurry Lane, Dunmurry, Belfast.